Since I’ve been struggling to focus on the writing front, I thought a creative break might help. We worked on organizing/unpacking more things out of the garage (so we could finally get the van inside!) and I found two huge containers of cross-stitch supplies. Suddenly I found myself very much interested in working on something. This is huge — I haven’t started a NEW project since we moved from MN about nine years ago (although I did finish several WIPs). The monsters saw me dragging out all these intriguing materials, threads, beads, and twenty+ years of patterns, and all the sudden they all wanted lessons. It’s been hilarious, frustrating, and sweet watching them learn to varying degrees. Princess Monster doesn’t have the patience to sit and read a pattern. She’d much rather create her own. She can work pretty much independently. Littlest Monster wants to try making varying stitches all over her material. I didn’t try to get her to stay in the holes or follow any sort of pattern–she just had fun picking colors. Middle Monster shocked me. 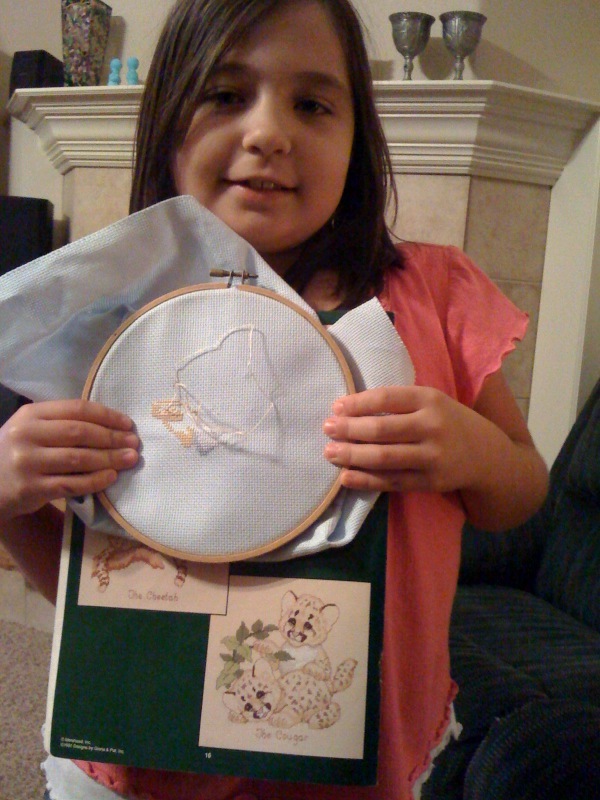 She picked out a pretty complicated pattern for a seven-year-old beginner (Gloria & Pat’s Endangered Young’uns–she’s making the cougars). She sat with me all evening making tiny little squares and learning how to follow the pattern. She stopped only because she said was starting to get a headache (and Mom needs to go to bed). She can’t read a pattern all by herself yet, but it won’t be long in coming. I’ll post a picture of PM’s own designed piece once she finishes it. For now, here’s Middle Monster proudly showing off her work, and then a picture of my short wip. 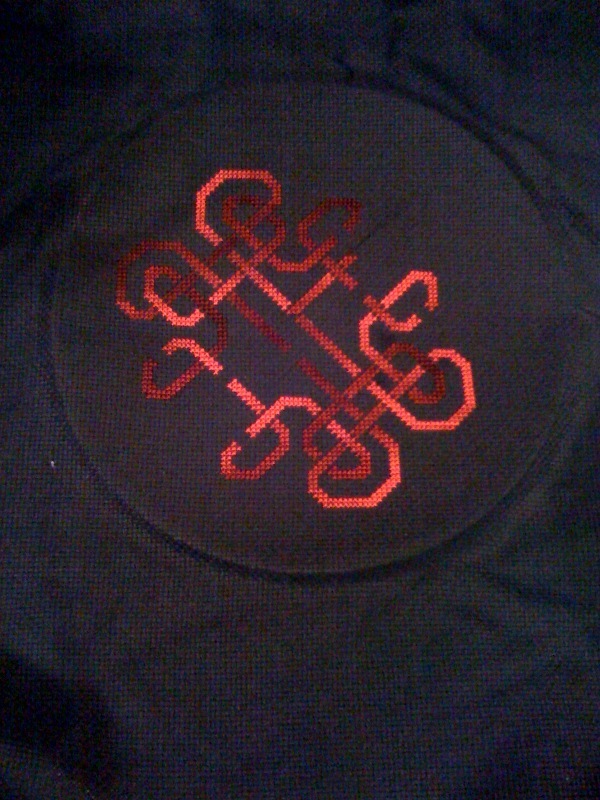 My pattern is a freebie from Ink Circles (my new favorite designer) stitched on black Aida with DMC 115 varigated red. It’s so nice that you’ve been able to find something to do together as a family. And you know what? Sometimes, using creativity in ways OTHER than writing, really help kickstart the muse. Thanks, everyone! Although MM’s interest didn’t last long. I think she did about 6 stitches today.